I suppose it’s a mark of success in and of itself when a milestone passes and you’re too busy experiencing the event to take time, at that very moment, to celebrate it. 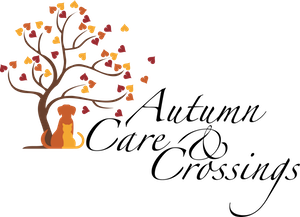 Two weeks ago we celebrated the second anniversary of Autumn Care & Crossings. What started out as a daydream has turned into a full-time practice, and such a core part of my world that I can no longer imagine what my life would be like without it. The practice of hospice, the philosophies and teachings, and the mindfulness that comes with it have shaped and colored both the way I work with my patients and their caregivers and every other facet of my life. In my first year of hospice practice I learned so much about what hospice means, and what running a business means – and those are lessons that I honestly believe will continue to grow and change as long as I’m alive. This year has seen me take a more formal turn towards both teaching and learning – the former through community outreach and lectures on caring for senior pets, and the latter through the IAAHPC’s Certification Program in Animal Hospice and Palliative Care. I am so honored to be part of that program – to be able to be present at the start of such an important phase of this profession, and to do my best to offer the highest quality of care to my patients and clients. At the same time, this year has brought the passing of some of our first and oldest patients. Saying goodbye to a beloved family member is never easy, and the closeness that hospice care brings means that I share, at some level, in the loss of those pets who have been in my care. In their memory, and in honor of every pet that has passed while in our care this year, Autumn Care & Crossings will again be making a donation to the MSPCA. I can think of no better way to celebrate the lives of all of these beloved pets than by helping another animal to become the beloved companion of a caring and loving family. The longer I travel along this path of hospice and end-of-life care, the more blessed I feel to have been called to it. And it is the pets and the caregivers themselves who make me feel so lucky – I am grateful beyond words to every family that has opened their home to me and trusted me to shepherd them and their beloved companions through this transition, for every hug, every smile, every tear, and every wag and purr. This is a precious phase of life, and you honor me by letting me be part of your team. Thank you. As our pets age, we face many different challenges and changes in our relationships with them. Part of this comes with the transition from companion to caregiver – older pets often require more support, medical care, and supervision, leading to a change in how we spend our time with them and how our pets behave around us. But there’s also the fact that frequently older pets aren’t interested in, or able to, take part in shared favorite activities. Dogs may be less interested in going for car rides or long runs; cats may not sleep in our beds or chase their toys anymore; and these changes impact our bond with them at the same time that we’re facing fear from difficult diagnoses, stress from changing care schedules, and frustration from struggling to medicate our pets or manage the symptoms of their illness or aging. In times like this, it’s incredibly important to find ways to maintain and support that bond, and to engage with our aging and ailing pets in ways that make them happy and remind us of our love for them and the joy they bring into our lives. Older pets can still be active parts of our families and our lives, and can still be incredible sources of love and happiness, if we’re willing to work with them. Every pet is different, but there are almost always ways to adapt their favorite activities to fit with their current levels of energy, mobility, and strength. For dogs with arthritis and mobility problems, the change can be as simple as adjusting your walking routines. Shorter walks can still be fun and bonding – or, if your pet isn’t able to walk all the way to the park and back, it may be easier to drive to the park and walk around there, then drive home. Adapting your route can help as well; walking on level ground instead of hilly areas or on surfaces with more traction can help an older pet still enjoy their time outside. Dogs who used to love to chase toys but aren’t able to run anymore can still engage in their favorite toy by walking after a slowly rolled ball, or a toy that was gently tossed a short distance. If your pet used to love car rides but now gets anxious in the car or can’t jump in anymore, mobility aids may help – a ramp or stairs to get into the car, and a seat belt harness once they’re inside, may help them enjoy this shared activity again. Older cats may withdraw from family due to unrecognized joint pain – if your kitty isn’t hopping up onto the bed or sofa, talk to your veterinarian to see if they’re actually in discomfort and if there’s anything that can be done medically to treat them. Also, stairs or ramps up to furniture can make it easier for an older pet with arthritis or limited strength to get back to their favorite perches. 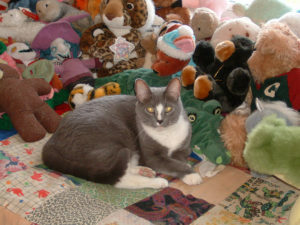 Older pets also often have diminished senses; toys with brighter colors, bells, or scented with catnip may be more appealing and more likely to encourage them to play and interact – and just like dogs, a few shorter play sessions may be more fun for a pet that tires easily. Ultimately, think about what you and your pet loved doing together, and talk to your veterinarian. Together, you can put together a plan to keep that shared fun in you and your pet’s life, and keep your relationship with them positive and rewarding at this new stage in their life. Facing the loss of a pet brings so many challenges to the people going through that experience – but the longer I work in hospice and end-of-life care, the more I realize that one of the most difficult parts of this loss for many people is just the fact that we live in a culture that doesn’t give us a guideline for how to navigate such a tragedy. While everyone experiences grief differently, for most forms of loss there are standard procedures and behaviors that we can look to, that help shape our reactions and let us know that what we’re going through is normal and accepted. We cry, we hold funerals, we send flowers, we partake in rituals that are given to us by our faith, our families, and our communities. But very few of those resources exist for the loss of a pet, and so often people don’t know quite how to behave or react in the face of that pain. So many times I hear clients ask me, ‘Is this normal?’ or ‘Does everybody do this?’ Or, even more tragically, they hesitate to ask for things that may comfort them or aid them in their grieving process because they are afraid that it will seem strange or silly. And I want, more than anything, to help dispel that fear and reassure everyone reading this that, whatever shape it takes, your path through loss is the right one for you. First, grief is universal in the face of loss. Different people may express it in different ways – some people cry, some are quiet, some tell stories; some people need company and others need to be alone; some need to take action and others need time for introspection – but those are all reactions to the pain and heartache of losing a living being that you shared your life with. It is entirely normal to hurt, to feel sorrow, and to mourn that loss. You are not alone or unusual in loving, caring, or hurting, and there is nothing wrong with having such love and compassion in your life that you grieve when that part of your family is no longer with you. Secondly, for all that grief is universal, mourning and memorializing are incredibly unique and personal. We all bring our own beliefs, history, and experiences with us to every relationship in our life, and to the passings that happen when those relationships end. As tragic as death is, every loss is in some way a celebration of the bond shared between the being that passes and the person or people who loved them, and a final chance to act to honor that bond. If there is something that feels like an appropriate way to honor your pet’s passing, or that would comfort you in the face of that loss, please tell your veterinarian. I promise you, it is not silly, you will not startle or offend us, and if anything we will be grateful for the trust you are showing us and the chance we have to help you and your beloved pet. Whether it’s making them a favorite meal first, singing a favorite song or reading a prayer or poem, having pictures of family who can’t be present nearby, saving a lock of fur, sending them with a favorite toy, treat, or symbol of faith after they have passed, or any other act that may feel right to you, please do tell us. This is part of why I describe what we do as end-of-life care, and not just euthanasia – there is so much more to saying goodbye to a beloved pet than just the act of helping them pass, and both you and your pet deserve to be cared for with compassion, respect, and kindness throughout that experience. I’ve said before that there is no one right or wrong way to grieve, and that holds true for the process of letting go. It seems paradoxical to say both that grieving is normal and that each person’s grief process is different and special, yet both are true, and worry and self-consciousness have no place interfering in such a challenging time. Your bond with your pet is unique, and it is our job (and our honor) as hospice veterinarians and caretakers of that bond to help both you and your pet navigate this final chapter of their life in the best way possible. Most of the time here, when I write it’s about how to take care of our beloved pets through the course of chronic or terminal illness, and how to take care of ourselves as we face that process. But it’s important to remember that our relationships with the animals that share our lives don’t end when those animals pass away, and that hospice and end-of-life care also encompasses honoring that bond and supporting the caregivers after a loss. Our culture has many commonly accepted ways to honor and remember the loss of people in our lives, but often I’m faced with clients who want to find some special way to remember a beloved pet but don’t have an idea of how. So I thought I’d put together a list of some ways to celebrate the memory of a pet that has passed. Make a keepsake box – this can be a way to save treasured items in a special place. http://www.countryliving.com/diy-crafts/how-to/g432/memory-boxes-0704/? Write: Tell the story of your pet and your life together. This may take the form of a blog post, poetry, a story, a childen’s book, or whatever form seems most appropriate to you. Whether you share it with friends, the world, or keep the words for yourself, creating the story can be an incredible act of celebration and memory. Hold a memorial service: invite your friends and family who also loved your pet to come together and celebrate their life. Ask everyone to share a favorite picture and memory of the pet, and celebrate your time together. Memorial jewelry: This can be anything from a pawprint necklace to a bracelet charm made from their collar or tags. There are also necklaces that can be made to hold a small amount of ash, if you have your pet privately cremated. Make a memorial garden: Plant a tree, a flower bush, or if you don’t have an outdoor space, a house plant in honor and memory of your pet. Commission a painting: have a portrait made from your favorite picture of your pet, to hang in a place of honor in your home. Make a memorial stone: Even if you are not able to bury your beloved pet, an engraved stone can still help remember and honor them. You can make one yourself and decorate it with family members, or order one custom-made for your pet. These are just a small handful of ideas – there are so many other beautiful ways to honor and celebrate those who have passed from our lives – but I hope they can act as inspiration for those of you facing the challenge of how to create a fitting memorial for a pet that you have lost. Today is National Pet Memorial Day – a day for celebrating and remembering all of the special animals who have made our lives better with their presence. AC&C is hosting an online memorial today; we invite everyone to comment here and share memories, pictures, and stories here in honor of our beloved pets. I have been lucky enough to share my life with so many amazing and beloved pets, but most of all today I want to celebrate Percival. My best friend, constant companion, study buddy all through vet school, and the cat who taught my current kittens how to be cats. He crossed half the country with me, slept on my pillow every night for over a decade, and his presence is still felt in my life every day. Thank you, Percy, for so many years of love. I still love you, I miss you, and you made my life better with your presence. This Sunday, 9/11 is National Pet Memorial Day. On that day, in honor of all of the beautiful, beloved, and special pets that have passed from our lives, AC&C will be hosting an online memorial, here and on our facebook page. On Sunday, I invite you to share a picture, a story, or a memory of a pet that touched your life. Together, here, we can honor their time with us and celebrate their lives. This will be a space of remembrance, and of shared experiences – by reaching out to tell the stories of our pets with others who have known both the joy of loving a special animal and the pain and grief of their loss, we can hopefully help ease that pain, and remember the happiness they brought to all of us. Some people look upon the relationship between a person and an animal as pet and owner. Some people describe themselves as pet parents, and the animal as their furry child. Others look upon the relationship as one between teammates, or partners, or friends. But whatever we call ourselves, the truth is that we all fill many different roles in our pets’ lives. We are their source of food and shelter. We give them love and companionship, just as they do for us. We keep them happy and healthy. And, as they age or develop chronic or life-limiting illness, our roles in their lives change – we become their primary caregiver as well as, or sometimes instead of, their source of play and companionship – and this can be challenging, both for them and for us. While we always provide care for our pets, there’s a significant difference between feeding, walking, cleaning the litterbox, and otherwise maintaining a healthy pet and managing multiple medications, appointments, nursing care, and household adaptations for an ailing or declining pet, and while we all know that bringing an animal companion into our life means agreeing to the former, very few people are prepared for the level of both emotional and physical labor involved in the latter. Being the primary caregiver for any chronically ill being, human or otherwise, is challenging. It takes time and money; it means dealing with bodily substances and putting in physical labor, whether that be carrying a pet that is no longer fully mobile or cleaning soiled floors or bedding. It means paying attention to details of multiple medications, managing schedules to be home and available when they need you, and it often means changes to your environment as well, as you build ramps or move furniture or adjust the temperature of your home to provide for their comfort. At the same time, it also changes your interactions with your pet – instead of being just a source of treats and cuddles, you’re now responsible for giving medications they may not want to take or providing grooming care that they may not enjoy. And they may no longer be able to participate in shared activities that strengthened your bond, like going for walks or sleeping in the same bed. All of these changes and challenges can create a serious burden for you as a caregiver, and can lead to feeling frustrated, hurt, overwhelmed, or like this is more than you and your pet can handle. So if you are facing this situation, there are steps that you can take to help make such a transition easier and less stressful. In this phase of life more than any other, it is critical to make sure that any care plan for your pet is designed around both your and your pets’ needs and abilities. If you know, for instance, that your pet is hard to give pills to, ask for other treatment options. If you have a strong objection to, or concerns about, a particular treatment, let them know. Your vet can help work with you to make a plan for your pet’s care that is manageable and not overwhelming. If your pet is on multiple medications, make a chart or get a weekly pill minder to help keep track of what gets given when. Make a calendar to track appointments or non-medication treatments. Use a chart or calendar to track any changes or observations you make about your pet. Being organized can help avoid mistakes, and can also help you feel like you have control over your pet’s care. -Find ways to maintain the parts of your relationship with your pet that you love. When you’re spending much of your time with your pet giving pills or changing diapers or treating problems, it can be easy to feel like there’s nothing more to your bond with them. Even if your pet is no longer able to engage in some of the activities they used to love, you can work with your family and your pet’s care team to find ways to bring those favorite activities into their life in new ways. A dog who used to love chasing balls may enjoy lying outside and rolling a ball back and forth; a cat who is too fragile to go outside alone anymore may still enjoy time on a screened porch or in a playpen in the sun; for most of the things in our lives that bring happiness we can find a way to adapt them to our pets’ new lifestyle. This is critical. Nothing makes us feel more helpless than a lack of support. Being a primary caregiver is an immense role, and we all need support ourselves. Reach out to family members, friends, and neighbors – sometimes just having someone to give your pet their evening medications for a night so you can go to a movie can be an immense relief. Likewise, finding someone to sit with your pet during the day once in a while can relieve worry about their condition and lighten the burden of their care. Many older or chronically ill pets that need frequent care can even benefit from a pet-sitter or dog walker stopping in on occasion to check on them, keep them company, clean up after them, or aid in their particular care. Don’t be afraid to make use of these resources, to help both your pet’s quality of life and your own. The transition from ‘mommy’ or ‘best friend’ to ‘chronic caregiver’ is a challenging one, but it can also be incredibly powerful. Let your friends, family, and veterinary team help you find your way through this new and challenging phase of your relationship with your pet. When I first learned about veterinary hospice and realized it was the field that I wanted to devote my life to, I knew that it was a new and emerging area of medicine, but I had no idea of how new. As I researched, studied, and spoke to other doctors in the field, I came to realize that I had become part of something that was still in the process of defining itself – that we were all building an area of study together – and that I was incredibly lucky to be part of such an endeavor. Part of what I love about hospice medicine is just how collaborative it is at the professional level. I love my clients and my patients, that goes without saying. But I also love conferences that are equal parts give and take, where attendees are invited to share their experiences and practices in the hopes of improving the field overall, where everyone is learning and growing and practicing, and where the fact that we have so much room to explore, improve, and educate is celebrated. To that end, the International Association of Animal Hospice and Palliative Care has just this year put together a certification program in Veterinary Hospice and Palliative Care. For the first time, there will be a set of standards determined for those of us who practice hospice medicine – guidelines of what resources we should have, what skills and facets of medicine we need to be trained in, what are the best ways to provide for the comfort of our patients and the well-being of the people who care for them. It will focus on providing a team of support for clients and patients, on communication as well as technical skill, on end-of-life care, and on pain management. It draws from human hospice and prioritizes educating caregivers and practicing cooperative medicine The program will take over a year, and those of us who complete it will have the honor of becoming Certified Hospice and Palliative Care Veterinarians. In particular, those of us enrolled in this year’s program will be the first-ever CHPVs. And I have been lucky enough to be accepted into this first class. I have no words for how honored and grateful and excited I am to be part of this. It’s an amazing feeling to know that I am helping define an entire area of medicine for future veterinarians; that I am helping build something that will bring comfort to so many people and pets as the field continues to grow and gain recognition. I’m looking forward to learning from amazing instructors who are pioneers in the practice, and to writing my own case studies. And most of all, I’m glad beyond words at the opportunity to learn how to take even better care of the pets and people who trust me with their emotional and physical well-being at this most vulnerable and critical stage of life. A common adage about medicine is that it’s called a practice because we’re never done learning and bettering ourselves, and I can’t wait to take this next step forward on my path as a doctor and caretaker! Recently, when I asked folks what topics I should write about here, someone asked, ‘When your vet prescribes a new diet or treatment for your pet, how long should you attempt it before you give up and go back to what you were doing before?’ And I realized that this question brought up something more important than the request itself – and that is the fundamental mindset behind it, and the difference between traditional Western medicine’s classical approach to treatment and the mindset of hospice medicine. And this mindset is one that can get in the way of successful care for many patients. The challenge with this question is threefold. First, by phrasing it that way and considering treatment from that approach, it assumes that the treatment itself is difficult, challenging, unpleasant, and generally something the pet is going to dislike and the client is going to struggle with. It sets the asker in a frame of mind where the automatic assumption is that the treatment is going to fail or be impossible to carry out, and the only question is how long to go through the motions before getting permission to stop, instead of considering the potential for easy treatment, positive experiences for the caregiver, and success. Second, it frames the question of treatment into an either/or situation. Either you are treating with one specific plan or you are doing nothing. It creates a false dichotomy, instead of allowing for a spectrum of options including multiple levels and methods of treatment. Finally, it is based upon a total absence of communication between the client and their veterinarian. It sets forth a situation where, when a client undertakes a treatment path and then faces challenges along that path, rather than talking to their pet’s health care team to let them know they’re having difficulty, they decide to cease all treatment. In hospice, communication and choice are two of the core concepts of our practice. The most important tool we have, both as pet caretakers and as doctors, is communication. If a particular treatment is suggested – whether that be a special diet, an oral medication, a form of physical therapy, or any other intervention – and that treatment is either too challenging for the pet or caregiver or isn’t improving the pet’s quality of life, it’s critical that we know. While we as doctors have a wealth of knowledge, resources, and experience at hand to offer to our patients, none of that can help if we’re not aware that it’s needed. Having these resources also means that, if one plan isn’t working, we can help form another. That may mean suggesting a second diet if the first isn’t palatable, a different medication if the first isn’t effective (or a different formulation if the pet isn’t willing or able to take the first), offering assistance or training to help implement specific treatments, or making a decision as a team to discontinue a particular treatment. And that last statement is, for me, the most critical one. While it may seem like semantics, I honestly feel that there’s a difference between giving up and choosing not to continue. Giving up carries a connotation of failure, which can also lead to guilt and blame – two emotions that can be incredibly damaging and undeserved for caregivers, especially in a hospice environment. Making a choice, with cooperation and support, is an active decision that is still focused around the well-being of the patient. Ultimately, when we’re facing an end-of-life situation, we know that eventually the patient is going to pass. We can postpone that day, and we can make every day along the path more comfortable and peaceful, but we can’t delay death forever. In that environment and mindset, I don’t feel that any considered and informed decision about treatment, or stopping treatment, is giving up – it’s just prioritizing different factors in the patient’s life. So – I don’t think of my clients as giving up at any point in their pets’ care, and I hope sincerely that they don’t either. It is my ultimate goal to create an environment where they feel comfortable communicating with me about any challenges they face and supported in any decisions they make. And I hope that those of you reading this can take this mindset into your day-to-day experiences with traditional wellness care as well.